How to make a classic like the popular AK-47 even better? 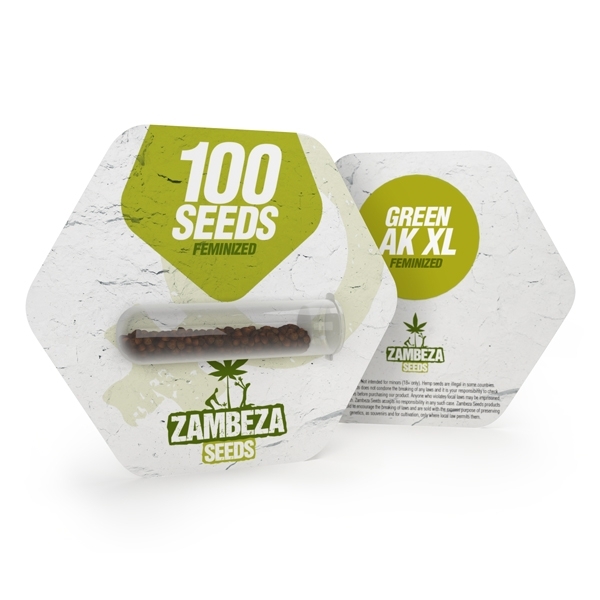 Zambeza presents to us their updated AK version where they successfully managed to greatly enhance this cannabis legend. Their new creation Green AK XL offers a lot more if you compare her to the original, and this applies to all her qualities from her growing vigour, yields and homogeneity to the strain’s fantastic flavour and high. Green AK XL Bulk Seeds: AK-47 Now Improved for Even Better Yields, Taste and High! To make their Green AK XL, Zambeza took the route of fusing together some genetics that couldn’t be any more diverse. They combined the already-excellent AK-47 genetics with Columbian, Afghan, Mexican and Thai landraces which resulted in a spectacular hybrid that satisfies no matter how you look at her. One of their main goals for making a new strain was yields. True to her “XL” name, Green AK XL brings a whopping up to 600-750g/m² to the table when you grow her indoors and she does it in a pleasantly short flowering time of only 55 days. Despite the fact that AK-47 has never been a strain that was difficult to grow, another plus for her is her rather compact growth that will normally stay at heights of 80-110cm making Green AK XL an ideal indoor plant for many types of growing environments. A lot of growers have in the past grown AK-47 variants in ScrOG setups which the strain has always been particularly well-suited for. Green AK XL however provides the added advantage that she’s also excellent for growing in SoG, thanks to the high homogeneity of her phenotypes. In other words, this variety is incredibly flexible no matter how you want to grow her. Needless to say that you can also grow her outdoors where she can reach between 140-180cm with yields of up to 750g per plant. Smoking Green AK XL is an incredibly pleasant experience. She is spicy yet pleasant with a complex flavour profile that perfectly blends a variety of aromas with hints of pine and even some fruity tones sprinkled in. Like her great taste, her effect is equally outstanding. With a good 18% of THC content, she’ll make for a great Sativa high that is energising and uplifting. If you smoke some more, her cerebral effect will turn into an awesomely deep physical relaxation. AK-47 has always been a strain that can be recommended without hesitation, even to those growers who don’t have a lot of experience. With their Green AK XL, Zambeza did a wonderful job to make an already fantastic strain even better which should put her all-the-way high on the list of strains that any cultivar will love to grow! For all those growers who need more seeds, the Green AK XL bulk seeds with 100 seeds per pack are a good choice.